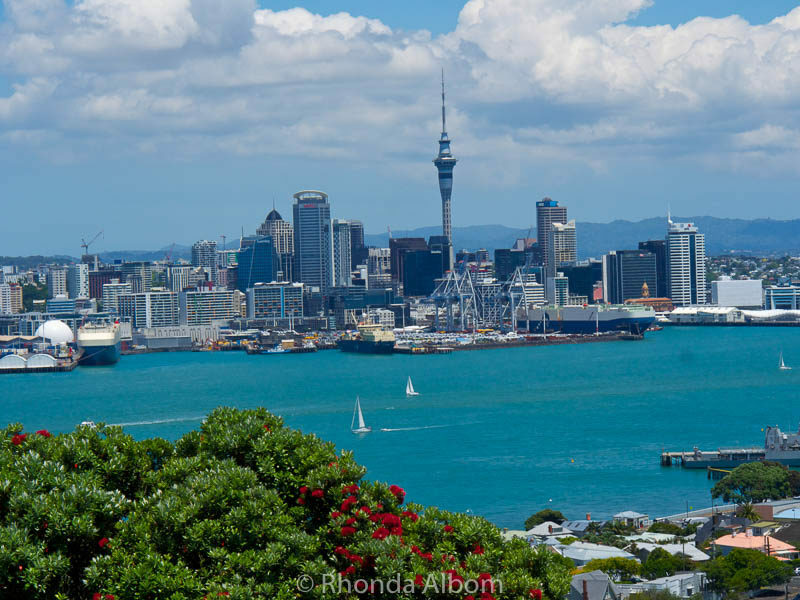 Auckland New Zealand greets nearly 4 million visitors annually. Some stay in the city, but more come to explore the lush green country. It’s this exploration that makes a visit to New Zealand so special. Sure, you can fly to the major cities, but what you miss along the way is the magic. An Auckland to Wellington drive is the best way to discover many of the New Zealand North Island attractions and a few secrets like enchanting gardens, bubbling earth, geysers, volcanos, museums, clever cafés, a huge corrugated iron animal, hobbit holes, and even a spring that produces most of the country’s drinking water. I remember the first time we took the Auckland to Wellington drive. We had one stop for food, a second for the toilet, and eight hours later we arrived in New Zealand’s capital city barely speaking to each other. Now, I look forward to the adventure. We have done the research and made the stops. What was once a too long, somewhat boring Auckland to Wellington drive, is now an exciting New Zealand road trip. Rural New Zealand is one charming small town after the next. We took two days to get from Auckland to Wellington, and more to return. If you are ready to self-drive New Zealand, read on. 7 Will you take the Auckland to Wellington Drive? New Zealand’s largest city is home to nearly one-third of the country’s population. I am amongst this crowd. It’s a great place to live or to visit. Whether it is nature, culture, or culinary delights, Auckland never disappoints. Auckland is also a starting point for many great adventures. To the north, discover Cape Reinga, the spiritual tip of the North Island. The west coast holds rainforest and black sand beaches. Travelling east, you can choose from the beautiful beaches of the Bay of Plenty, Napier, the self-proclaimed art deco capital, the rural countryside of Gisborne, and the less travelled (but truly amazing) East Cape. 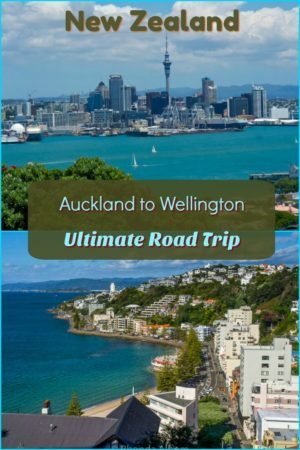 Driving south, you will pass through all the fascinating destinations on this page on your way to Wellington, the world’s southernmost capital city. If you like antique shops, then you won’t want to miss Paeroa. However, New Zealand’s antique capital is most famous for producing L&P (an abbreviation for Lemon and Paeroa). 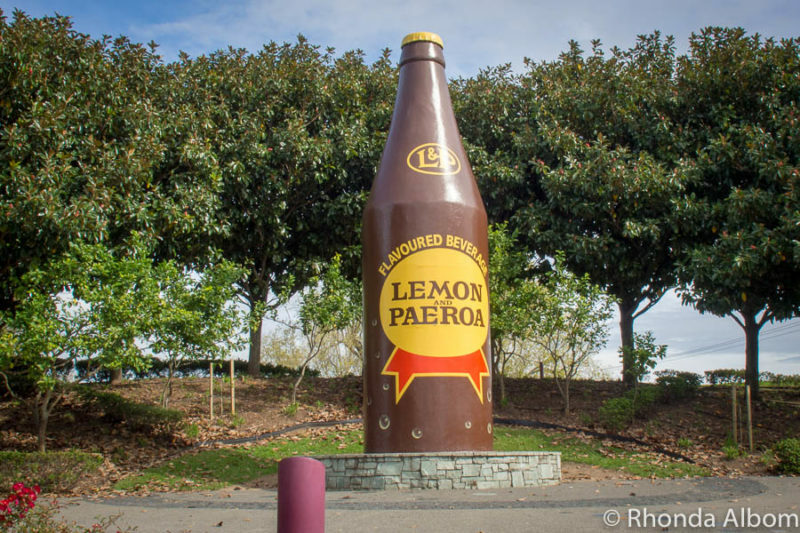 Don’t miss the giant L&P bottle near the corner of Normanby and Te Aroha Roads. 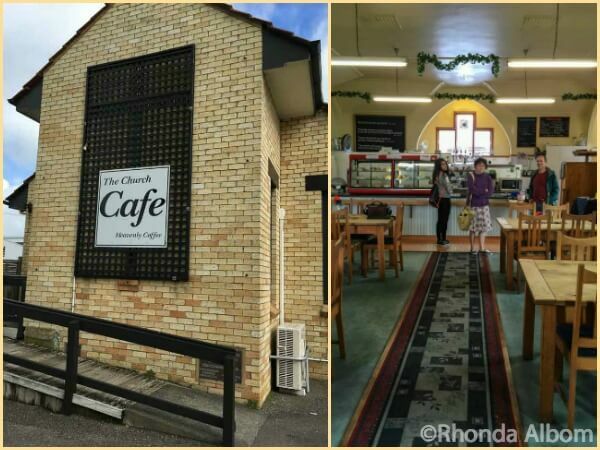 Our journey: For us, Paeroa was a coffee and browsing stop as part of our return Wellington to Auckland road trip. A masterpiece of nature, the Karangahake gorge was an active mine during the gold rush days of the late 1800s. From the old mine shaft tunnels, the miners blasted holes through the cliff face to tip tailings into the gorge below. Today, the holes are called “windows” and offer dramatic views of the gorge and river. Bring a torch (flashlight) as it is dark inside the tunnels. The Karangahake Windows walk takes about an hour. View of Waitawheta River as it cuts through the Karangahake Gorge. Our journey: We stopped at Karangahake Gorge on our return drive from Wellington to Auckland. We chose the 2.5 km Karangahake Windows walk from the many hiking options. 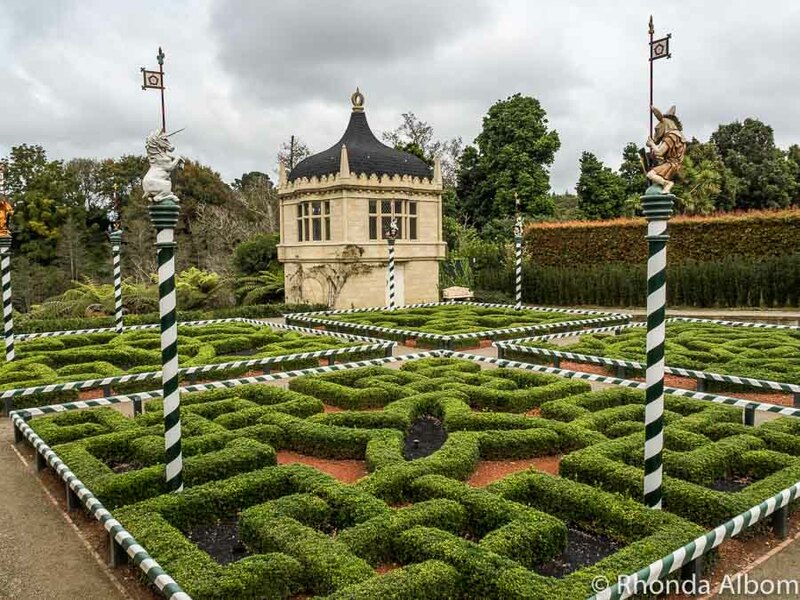 New Zealand’s fourth largest city is home to the internationally acclaimed Hamilton Gardens as well as the country’s only tea plantation, a zoo, 11 km riverwalk trail along the Waikato River (New Zealand’s longest river), and a tribute to former resident Richard O’Brien (screenplay writer and actor in the Rocky Horror Picture Show). It’s the gardens that draw about one million visitors to Hamilton each year. One could easily spend a full day (or more) here and then head out in the morning. One of the themed gardens at the Hamilton Gardens. Our journey: We spent half a day in Hamilton, stopping only to visit the gardens, enjoy lunch, and see the Riff Raff Statue (Rocky Horror). This is it, Middle Earth, the lush green pastures and hobbit holes of the Shire. 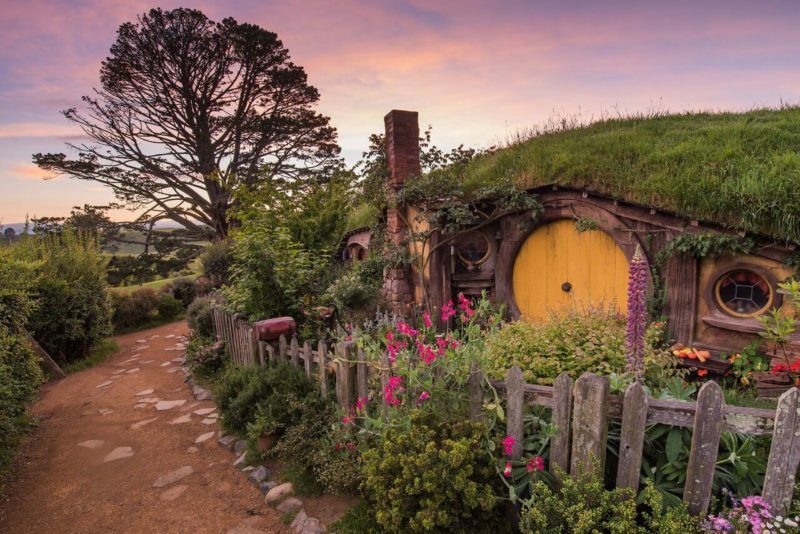 For fans of The Hobbit and The Lord of the Rings trilogy, Hobbiton is a must see. Photo provided by Hobbiton Movie Set and used with written permission. Our journey: A once in a lifetime visit, we opted not to stop at Hobbiton on our most recent New Zealand North Island road trip. 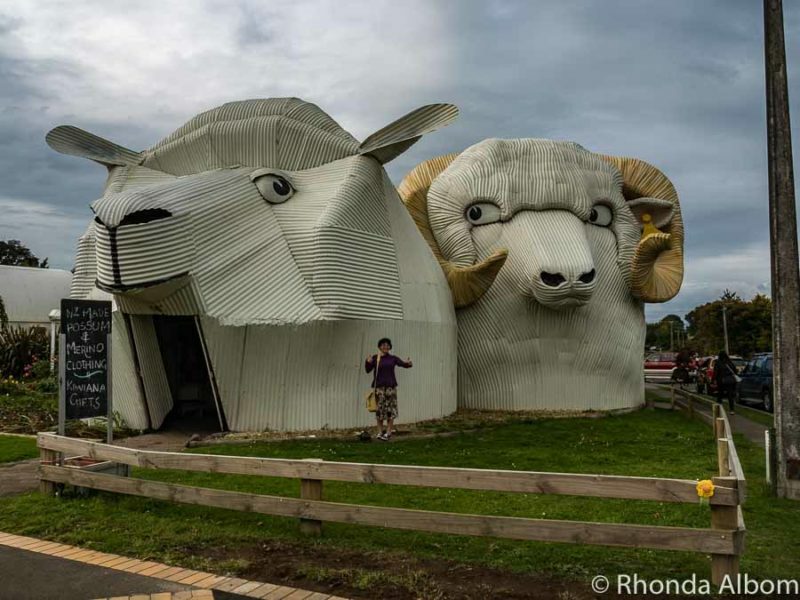 A creative solution to revitalizing a town, in the late 1980’s Tirau resident Steven Clothier designed and erected huge sculptures in corrugated iron. A great place to stop, stretch your legs, visit craft shops, have a coffee, or just walk around and admire the interesting corrugated creations. Be sure to bring your camera. Our journey: We took far too many photos in this tiny town, and even picked up a few souvenirs and snacks. 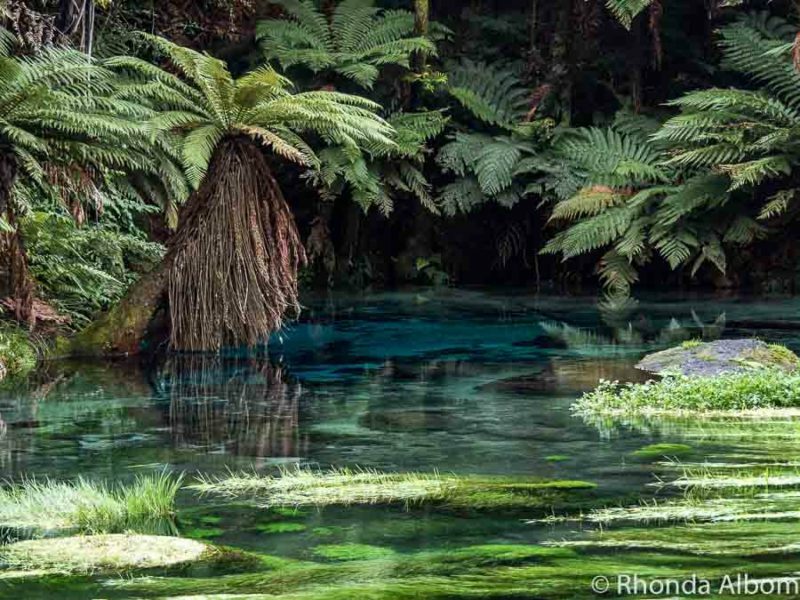 New Zealand exports about 9 million litres of water each year, and nearly 70% of that water comes from the Blue Spring. The walk lets you stretch your legs, and brings you to colourful nature at its best. From end to end, the walk is 4.7 km and takes about 90 minutes each way. More on the Blue Spring coming soon. The Blue Spring at Te Waihou Walkway in Putaruru. Our journey: We parked at the Leslie Road end, and walked to the spring and back. It was about an hour in total. The Waitomo Glow Worm Caves are one of the more popular North Island tourist attractions, and while they are between Auckland and Wellington, they are not on the route we are recommending if making a one-way journey. However, they are worth a visit if you have never seen Arachnocampa Luminosa, a glowworm species found exclusively in New Zealand. 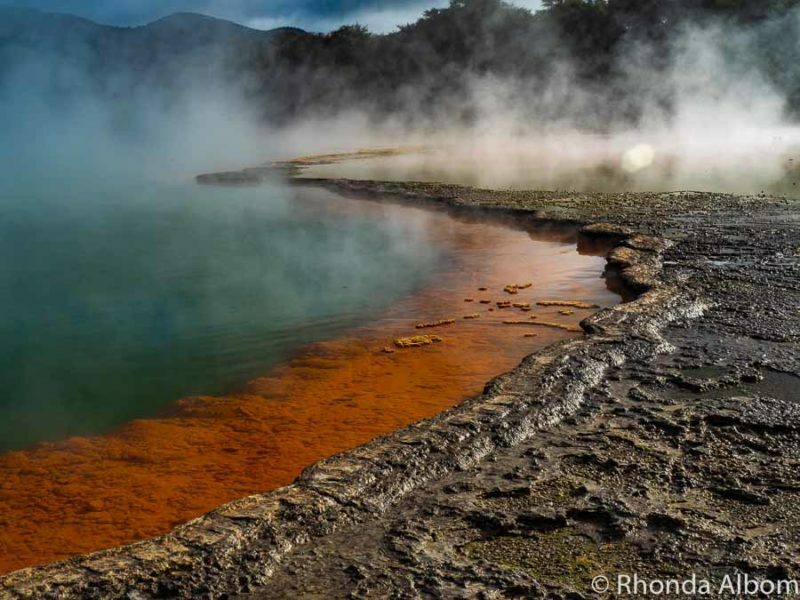 A destination on its own, Rotorua sits on a geographic fault that created a geothermal wonderland. 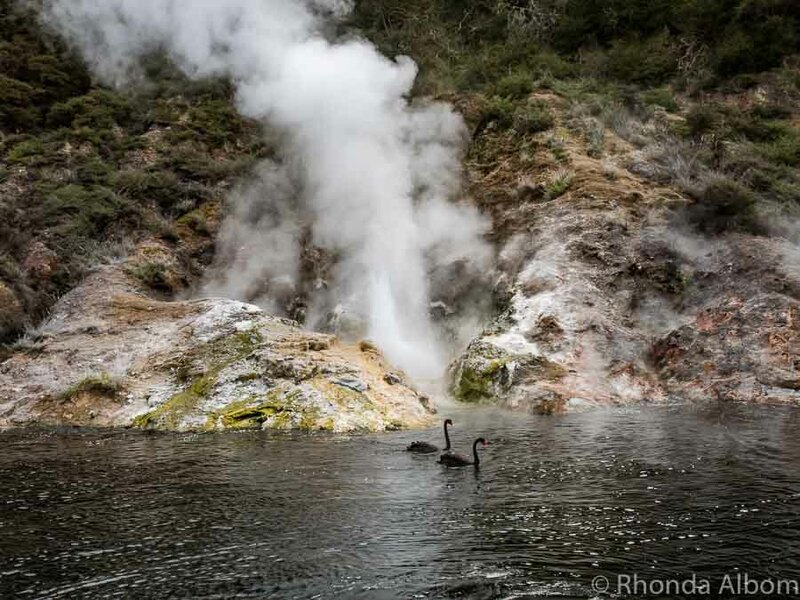 Water and earth rich in minerals, Rotorua is the place to rejuvenate. The bubbling earth, rising steam, and colourful mineral elements create a landscape that will keep photographers busy. It’s a city offering impressive Māori cultural discovery opportunities, as well as being home to the Agrodome, a large working farm open for tours and show. And if that’s not enough, it’s also home to adventure with opportunities for bungy, luge, downhill ball rolling, mountain biking, and more. While you can try to do the highlights in a day, you will miss a lot. We recommend spending at least one night, ideally more. Being fans of accommodations that are clean, comfortable, and offer a touch of luxury, our favourite place to stay is the Rotorua Novotel Lakeside. Our journey: We opted to visit Rotorua as a separate New Zealand road trip; but remember, we live in Auckland, so we have more flexibility than visitors. Lake Taupo is New Zealand’s largest lake and Australasia’s largest freshwater lake. It offers a picturesque serene setting for sitting in a café. Taupo is also a place for adventure (skydiving and bungy jumping). The lake drains towards the Waikato River. 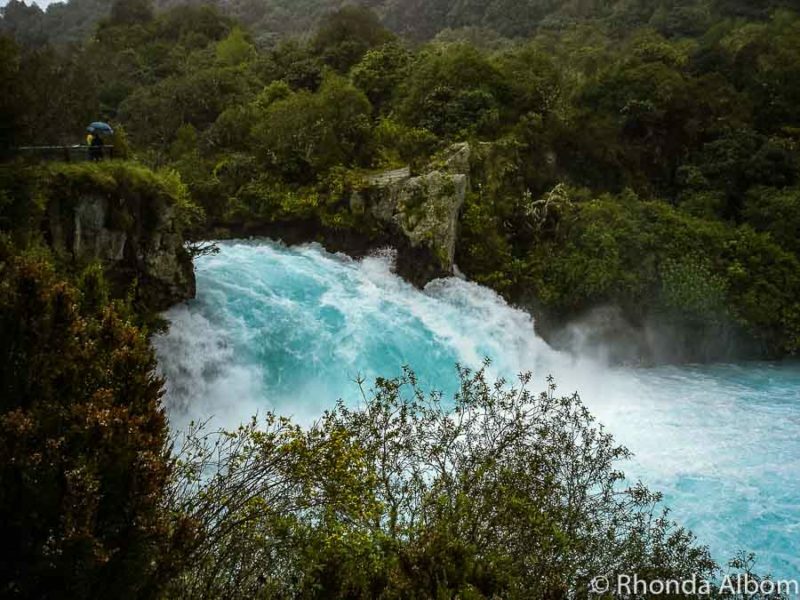 It narrows as it flows over Huka Falls at more than 220,000 litres per second. An easy place to spend the night if you are doing a multi-day Auckland to Wellington drive. A town famous for its fly fishing, it is also a base for those who are doing the Tongariro Alpine Crossing, as well as for skiers during the winter. Our journey: We spent the night in Turangi. Standing next to the Tears on Greenstone Memorial (Roimata Pounamu) we could feel the history all around us. It is at this spot that all New Zealand army recruits take their oath. Crochet poppies fill the walls. The original request to the community was 1,000 poppies, but handmade poppies kept arriving. The revised goal became 18,166, one for each New Zealand soldier killed in battle. However, the poppies kept coming and well exceed that goal. The museum takes us through New Zealand’s interesting military history, both with the UK and Australia. A little-known piece of trivia, the lifelike faces in the displays are created from casts made of museum staff member’s faces. 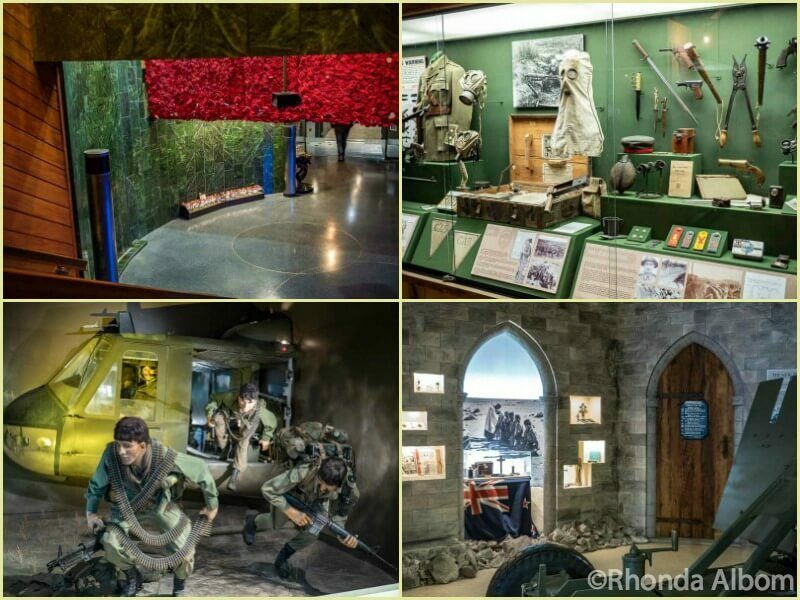 Our journey: By spending the night about an hour north in Turangi, we arrived at the National Army museum when it opened. We spent the morning at the museum, then continued on our North Island road trip. 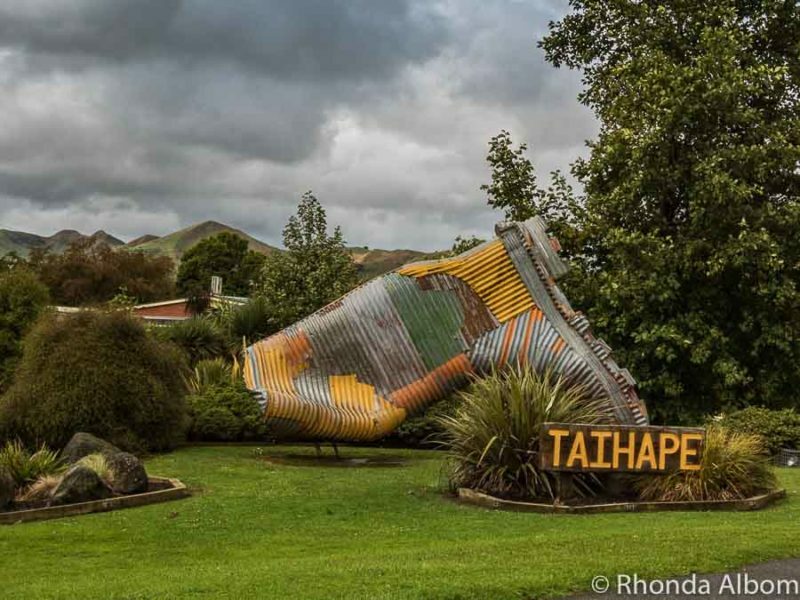 If you love the corrugated iron in Tirau, you won’t want to miss the giant boot welcoming you to Taihape. Our journey: For us, Taihape was a photo stop. As you enter the town of Bulls and see their slogan, “a town like no udder” you know it’s time to start paying more attention to the shop names and the road signs. It’s a town with a sense of humour, although I’m not sure it’s a good one. Embracing their town name, the puns are everywhere. And a road sign reads, “Family Violence is not Accept-A-Bull. Finally, we passed one store called, “What a load of Bull.” This is only the tip of the bad pun iceberg. Our Journey: We only drove slowly through Bulls, taking notes as we passed. By now, you have earned a coffee break. Just a few minutes after leaving the town of Bulls is the town of Sanson. Here, an old church turned cafe offered ‘Heavenly Coffee’ on their sign. The Church Cafe lives up to this standard. The coffee was divine, and the stuffed baked potato even better. Our journey: We stopped at the Church Cafe for lunch. Tui, a beer “irresistible to men“, has been brewed in Mangatainoko since 1889. The secret may be the water from the Mangatainoko River, or it may be the brewing process. A lot has changed for Tui over the years. They have downsized their Mangatainoko facility to the point that it is now a microbrewery, brewing only for that location. The tour and tasting take about an hour. Whether or not you take a tour, the cafe is outstanding and worth a stop. The food was great, the atmosphere lively, and it’s a chance to try some of the beer brewed at this location. More on our tour coming soon. Tui Brewery still looks just like it did in the old commercials. 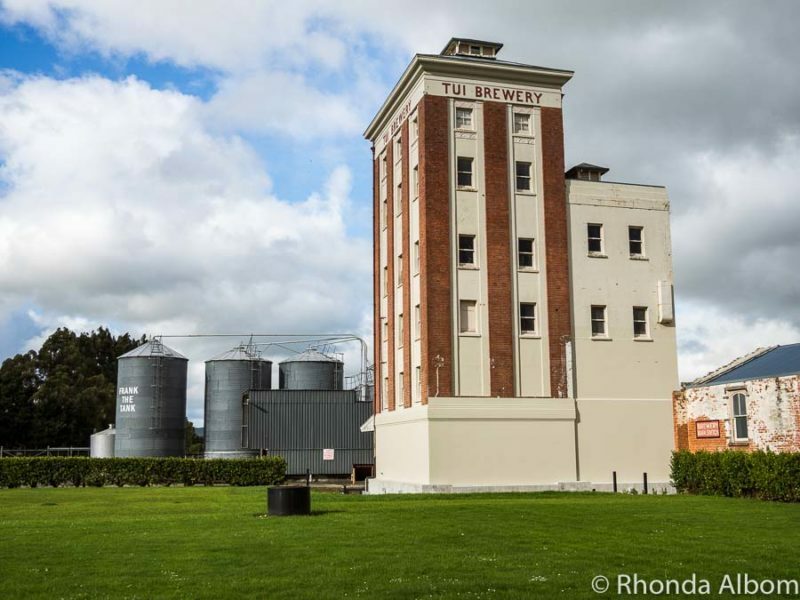 Our journey: We opted for a much longer journey and stopped at the Tui Brewery for lunch and a tour as we drove from Wellington to Napier on the east coast. Did you know there is a stone circle in New Zealand? Fascinating on different levels, it represents the history of ancient stone circles combined with their power. It is not a replica of England’s famous Stonehenge, but rather a purpose-built structure of similar size to the one in the UK that has been built for its surroundings. 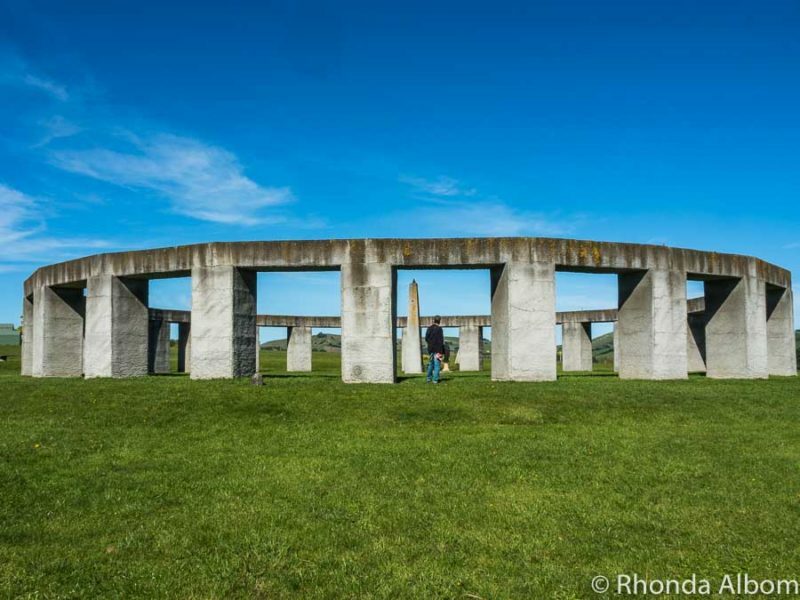 Our journey: We explored Stonehenge Aotearoa between Wellington and the Tui Brewery. Finally, our destination. I love New Zealand’s capital city as a getaway destination. Home to the government buildings, it is a lovely waterfront city with plenty of interesting things to do. The Wellington waterfront as seen while hiking to the summit of Mt. Victoria. Our journey: We have visited Wellington many times. As part of our recent New Zealand driving holiday, we spent three days in New Zealand’s capital. This is not a New Zealand road trip, but rather a drive from one point to another. With 8 hours of driving in a day, you need an early start if you hope to make any stops. At a minimum, you can look out the window and enjoy Lake Taupo, the corrugated sculptures in Tirau and in Taihape, and the signage in Bulls. 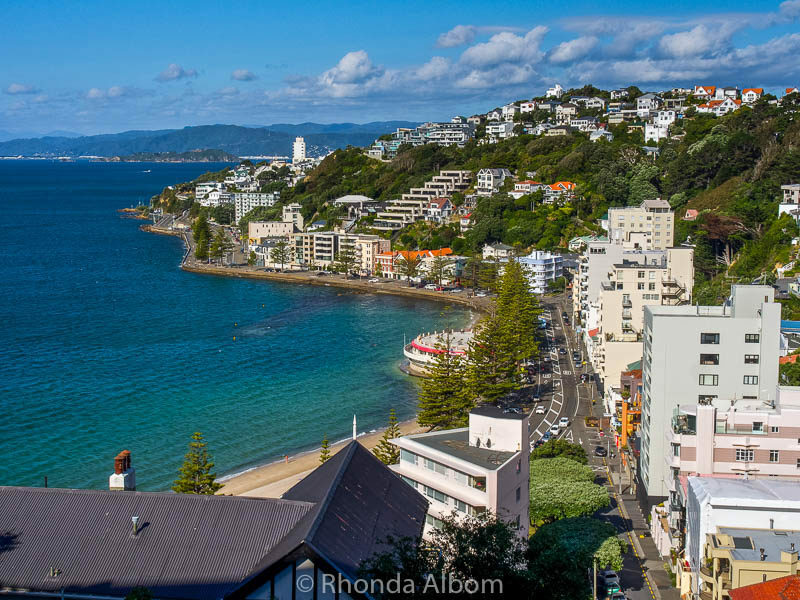 ** You will want to add at least two days in Wellington, we prefer to spend at least three. ** You will want to add at least one day in Rotorua, again, we prefer to spend at least three. Nonstop, the Auckland to Wellington drive time is 8 hours. In New Zealand, we drive on the left side of the road. The speed limits in New Zealand tend to be lower than those in other countries, but the tickets for speeding are on par. New Zealand motorways are great, but once you get into rural areas, you might find some of the New Zealand roads not quite what you are used to, but still fine. Air New Zealand and Jet Star both offer daily flights. If I haven’t convinced you that driving is the better option then⇒ Click here to check flight times, prices, and availability at Cheapflights. There is also an Auckland to Wellington train, which won’t save too much time but can be a good option if you don’t have access to a vehicle and don’t want to fly. ⇒ Click here to check times, prices, and availability of the Northern Explorer. Or, there is a bus. If you enjoyed this article, please share it on social media, including Pinterest. 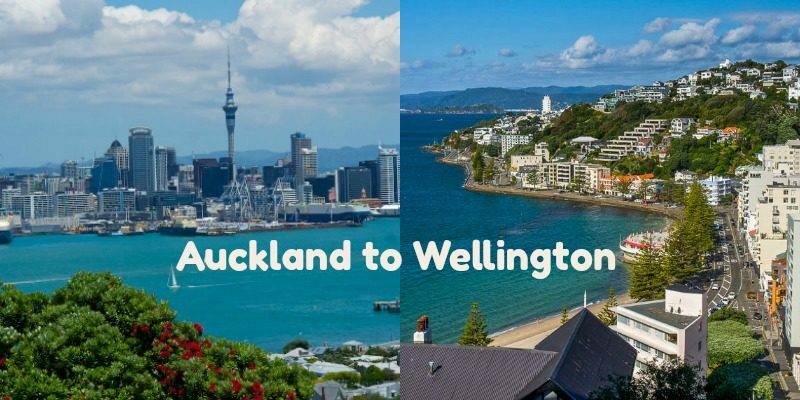 Will you take the Auckland to Wellington Drive? Disclaimer: We frequently work with local tourism boards and are often provided with many complimentary entrances, tours, sample items, or media rates to assist in the writing of Albom Adventures. However, our recommendations are from the heart, and the opinions expressed here are strictly our own. Need to get back to NZ and explore more of the North island. We only spent 2 days in Auckland the rest of our time on the South island. Have heard great things and it looks like there’s some great road tripping to be done. Thanks. Thanks for the for sharing your experience with us. I always love to read a road trip article and find it fun and inspiring! I had NO idea there was that much to see between Auckland and Wellington! You have me hooked on Matamata aka Hobbiton! This is such a great resource. 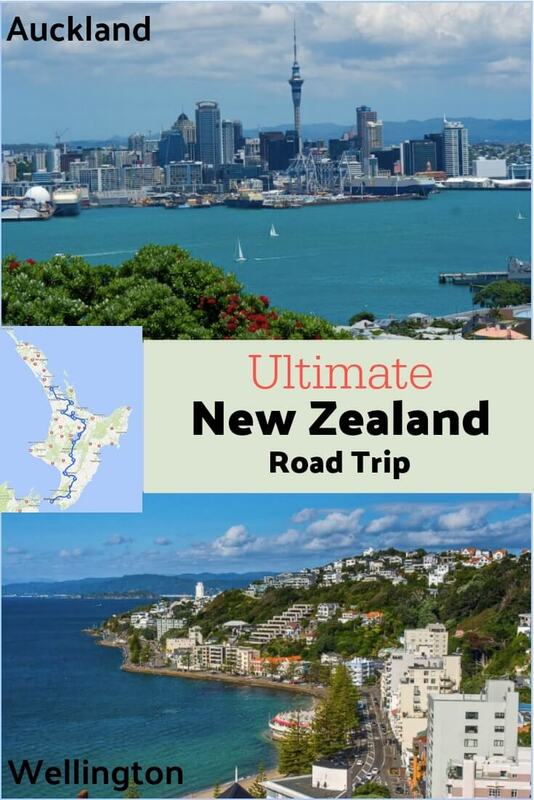 New Zealand is high on our list and we love doing road trips around countries. Thanks for all the info! Wow, what an amazing road trip! I would love to visit the north island for those glow worm caves and hobbiton! Clever cafes and hobbit holes sound like a perfect pairing for a road trip… count me in! I used to have Australia above New Zealand for some reason but the scale has tipped and New Zealand is now at the top of my list. Brilliant itinerary! Have bookmarked this for a future return visit to New Zealand. Can never visit too much — Christchuch was amazing. Auckland super fun. Waitangi Treaty Grounds moving. Last visit there was simply a jumping off to get to Fiji for a sailing adventure back to New Zealand … another adventue unto itself. And always LOVE your photos … a highlight of opening your posts. I never cease getting excited every time I click your link and today was no different! Thank you for sharing this recap! I would take the road trip to see all of these than the train or fly over. I’ve seen so many stunning photos of Auckland and Wellington but not with all of these spots you visited. It’s my first to see waitomo glow worms cave so spectacular. 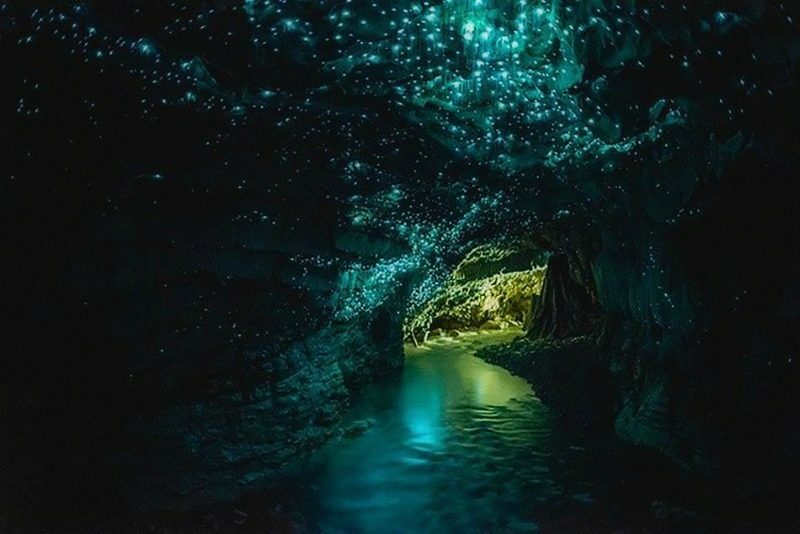 I’d take the route the same way you did just to see this waitomo glow worms. Awesome road trip! I’d love to do this someday especially to see Hobbiton. So cool! These are great suggestions!! If i did this drive i would totally stop in hobbiton!! That is a bucketlist item for me and something i can’t wait to do! This post brings back so many wonderful memories! I used to be a tour guide in New Zealand and many of these stops were on my tour route. I had my first skydive at Lake Taupo, my first dip in natural hotsprings in Rotorua and my first spelunking experience in the glow worm caves of Waitomo 😍 Somehow I never made it to Hobbiton… I guess it’s a good enough excuse to go back ! Hobbiton is quite a bit more commercial than any of the places you mentioned, but yes, it is a good excuse to come back – if you need an exchuse. That East Cape is eye-popping! The homeowner took us for a ride from Opotiki. 3 hours of stunning views and quite an intense ride too. We loved Wellington. Different feel to it, as the place was somewhat similar to San Francisco. Chill, low-key, neat buildings and a hilly terrain too. Will not forget the flight in; those were some strong winds, fitting for the Windiest City on Earth. I agree, I love the East Cape, and even though we added it into our personal around the North Island itinerary, it’s not part of the one on this page. A road trip between Auckland and Wellington is a great way to explore the North Island. The Auckland to Welling road trip indeed has all the trappings of an epic trip. The stops have something unique to offer. So many places, I am sure one would never feel the drive to be long or tedious. Some of my favourite and must visit places here would be Hobbiton, Stonehenge, and Rotorua, these places look spectacular, I am sure the experiences are to be cherished for a long, long time. You did pick some of the best spots, although the Army museum caught me by surprise, being far more interesting than I expected. Funnily enough, I was just looking into visiting NZ one day and then I came across your blog. 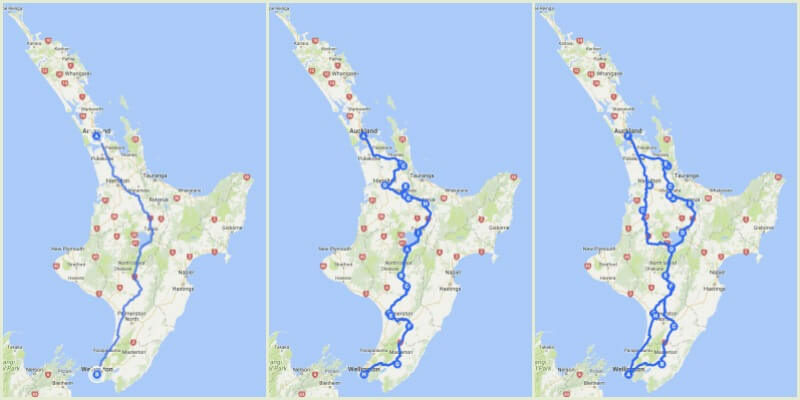 NZ looks like a beautiful country, so doing this road trip is certainly the best way to explore the country. I like how many details you provide to the visitors. Thank you for all the ideas! Yes, New Zealand is beautiful. There is a lot more to New Zealand than just this portion of the North Island. Many of the most beautiful spots are on the South Island. Wow, I can’t believe there is all of this to see between the two cities! Or that you did the whole drive with just one toilet stop the first time! The glow worm caves look amazing, as you say actually there is more here than on a simple road trip – this is a whole holiday in itself! Hobbiton is definitely on my list, after getting a taste of hobbit houses in Guatemala I really want to see the ‘real’ thing! Remember, when we did the whole thing in on go, we didn’t make any other stops, so it was eight solid hours of driving. Just to let you know Rhonda, I may no longer be able to write my blog. This thing called widget took over my blog and I can’t get into my blog. I’ve had some friends try to help but to no avail. But I’ll still be able to check on you. You won’t be able to get rid of that easy. LOL See ya. Well, I certainly would love to do this someday! The exportation of water has become a political thing lately. I am not sure it will continue forever. What a fab tour Rhonda the Corrugated figures in Tirau made me smile heheh! They made me smile too, and I only shared the dog and sheep. They are everywhere in the town. Wow, what a trip. Every time you show me great pictures of New Zealand, I just want to go. See ya Rhonda. One day Paul, I will have you convinced. There are ships that come here. In fact, we are sailing from LA to Auckland next month. New zealand is really a fab place for a road trip. 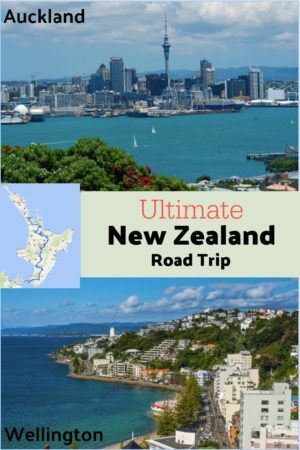 We drove from Auckland to Wellington stopping at Rotorua and Lake Taupo on the way, but your fab post and different itinerary suggestions made me realise there is so much more to see and do! I think you did what many people do. Next time perhaps you will choose a different way. I wish I had this post about six years ago when I made this exact drive! Of the places you mentioned, I went to Waitomo, Taupo, and Rotorua. This is still one of my favorite trips of all time. Same here, I wish we had done the research and made the interesting drive years ago. We have just gone straight through too many times. 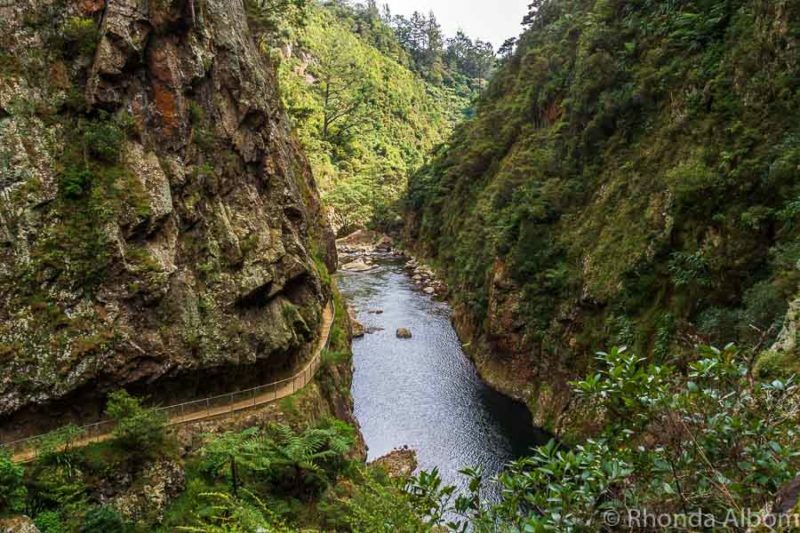 Ooh the Karangahake gorge looks amazing. I haven’t yet made it over to New Zealand, not through lack of wanting to, but a few more places to tick off first (Sri Lanka is next). I never knew there was a stone henge in New Zealand, that’s bizarre and amazing in equal measure! Hamiliton looks and sounds like a great place to stop! Everything on her does, to be honest! I can imagine that NZ is like living in a fantasy world because everything looks awesome!! LOL – it did seem a bit like a fantasy world when we first moved here 16 years ago, now it’s just the fabulous place that we live. Wow. So many great options on the trip to choose from. 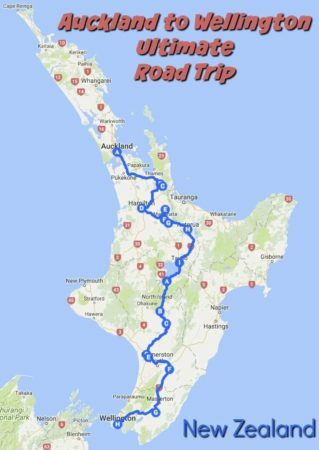 Would love to do Taihape and Stonehenge ? replica. The variety on the trail seems amazing. Thanks for sharing! Who doesn’t love a good road trip? New Zealand sounds like a great place to see some quirky sights. I love all the names of places in the town of Bulls. I also like the corrugated tin artwork, for I have never quite seen that. The blue waterfall at Taupo looks amazing? Are there many hot springs to visit in New Zealand? The geothermal region of Rotorua, Taupo and everywhere in the middle is filled with hotsprings, plus there are some on the South Island. It’s very true, New Zealand is filled with charming little hide-a-ways and hidden secrets. Where did you stop along the way? We are the same, we used to drive straight through, now we take our time and enjoy. I’m not much of a city person, so I’d be out in the country side soaking up the wide open spaces. I am a bit of both. I love the city, but also love the escape the rural areas.